Whether it’s our weekly topdressing program or a new construction project we at Lowville Golf Club depend on top quality products and technical support. 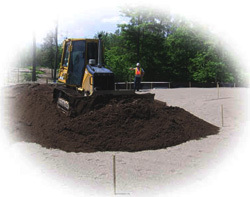 Hutcheson Sand & Mixes provides us with everything we require in one phone call.. Please complete the fields below and one of our staff will contact you promptly! Hutcheson Sand provides a full range of rootzone mixes. Our custom rootzones meet a variety of different requirements. Whether it is USGA, California or a modified version of these specifications, we have the expertise to produce. All contents © 2019 Hutcheson Sand & Mixes.